Hi there, and welcome to our blog. We’ll be using this space to provide you with information and updates about our services, as well as tips and advice relating to home health care services. Our At Home Companions team provides many wonderful senior care services to assist you and your loved ones maintain your independence by continuing to live in the comfort of your home. Our experienced team is committed to managing the health and well-being of each and every one of our clients, and we’re dedicated to providing our clients with the care and compassion in-home care requires. Our goal is to get to know our clients on a personal level by listening to their stories and learning about their individual needs, which allows us to design a personalized care plan for each client so that we may assist them in a way that best fits their needs. While most people would prefer to remain in their homes well into their senior years, for many, deciding on whether or not in-home care will fit their individual needs and lifestyle can be quite challenging. This is an important decision which requires a lot of thought and careful planning, which is why for our first blog post, we would like to begin exploring some of the many benefits of home health care services. Looking at some of the many wonderful benefits may help you and your loved ones determine if this is a viable health care option for your individual needs. Please continue reading below. As mentioned above, it is important to most people to maintain their independence and dignity as they age. While most seniors would prefer to continue living in the comfort and familiar surroundings of their home, many individuals have special needs often related to their health, which can impede on them living independently. One of the greatest benefits of home health care services is that part-time, full-time, or live-in caregivers can help seniors maintain their independence while living at home. Having someone there to assist with shopping, meal preparation and nutrition, light chores around the home, rides to and from doctor’s visits, and medication management can really improve someone’s ability to remain in their home, rather than having to move into an assisted living facility. While there are affordable payment plans for seniors moving into senior or assisted living facilities, in-home health care services is also a cost-effective option, especially for seniors who live near their families or receive some assistance from their children and grandchildren with day-to-day living. According to AARP, senior living facilities generally cost around $50,000 annually and may cost even more depending on where you or loved one lives. In New Jersey, the average cost of a one bedroom with single occupancy in a nursing home costs around $68,700! What’s more, about one-third of nursing home residents pay for these facilities out of pocket. While there are some scenarios that make a senior living facility a better living option for some, this is not the case for every senior, as many are capable of remaining in their own homes with assistance from professional caregivers. At Home Companions offers a variety of affordable options for home health care services that are meant to work well with various individual needs. Often times, children and grandchildren of seniors play a key role as a caregiver to their elder. Whether a senior shares a household with their family, or family members stop by their loved one’s home to check on them daily, drive them to appointments, help them with household chores, and so on, there are times when you as the caregiver simply aren’t able to be there. That’s where we can help. Our trained and qualified caregivers can be there to assist your loved one any time, any day. Our team understands that between a job, raising a family, running errands, and so on, life is hectic. Home health care gives friends and family members peace of mind in knowing that a compassionate, well-trained professional caregiver can be there for loved ones. 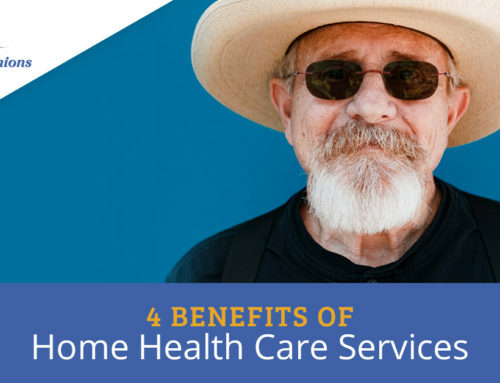 These are just a few of the many great benefits you and your loved may gain from our home health care services. Tune in next time as we continue looking at the advantages of our caregiving services in the second segment of our short blog series. Also, be sure to visit the At Home Companions website to read our blog, learn more about the various home care services we offer, and get updates about home health care. Please give our friendly and dedicated team a call if you would like to meet with us to get started on a home health care plan that matches your individual needs. We look forward to working with you and your loved ones. Things are more clear for me now. my response was lack luster. My wife has been thinking about getting an assistant for her parents, but she isn’t sure where to start. I like that you mention how they help seniors maintain their independence. This would no doubt keep him happy in his old age. Thanks for sharing. I really appreciate this article, talks all of the needs for the elders. And I want to have this kind of assistant that will keep my father safe and healthy, in this I have assurance when I am in work that they are in the good hands. Thank you for sharing and helping me to find the right ones. Great job!